What does a thin Jewish kid growing up in Birmingham who has an obsession with opera and aspires to be the next Enrico Caruso wind up doing? If you answered “become a professional wrestler,” then you clearly have met Sam Tenenbaum Jr.
His autobiography, “The Unmasked Tenor: The Life and Times of a Singing Wrestler,” was recently released, and it describes how he went from a weak kid to a star of the regional wrestling circuits in the Southeast, as the masked Great Kaiser. As a child, he loved music and developed quite a voice, but he also was a target of school bullies and not a great student. His parents sent him to Marion Military Institute to get some discipline. Interacting with other students there, he quickly learned that he needed to develop some fighting skills. That, plus a regimented training system, meant that when he came home he was a different person, physically and mentally. He went to the University of Montevallo to pursue a music career — though with a “safe” liberal arts degree to fall back on, but which did not interest him at all. Working out at the downtown YMCA in Birmingham, he met Joe Honeycutt, an established wrestler who saw potential in Tenenbaum and offered to train him. His parents were skeptical, and insisted that he not wrestle in Birmingham, where they were known to everyone, and have a stage name on the road. Soon, Tenenbaum had his first wrestling appearance, in Oneonta. He let Honeycutt choose a name, and he “almost had a stroke” when he got to the venue and found that he would wrestle as “The Jewish Angel.” Nick Carter, a wrestling promoter and Tenenbaum’s opponent in the ring that night, gave him the name for showmanship and controversy. Bitten with the bug, Tenenbaum continued getting onto wrestling cards, generally as the newcomer who was cannon fodder for the established wrestlers. He chose the innocuous name of Bob Kaiser as his stage name. He worked his way onto televised cards out of Atlanta, worked Florida and the Carolinas, building his reputation and persona. In 1975, bodybuilder Arnold Schwarzenegger came to Birmingham with Sally Field for the filming of “Stay Hungry.” Regulars from the YMCA assisted with the production, none more enthusiastic than Johnny Peebles III, who Tenenbaum had recently met. Schwarzenegger told Tenenbaum that the name Bob Kaiser was too small for him, and he needed a name with “Great” in it. Soon, the masked Great Kaiser was born. No longer in the role of getting run over in the ring, the Great Kaiser upped his showmanship with Peebles by his side as manager. Tenenbaum noted that they definitely turned heads — it wasn’t just a 280-pound wrestler in a mask, but he was accompanied by a long-haired manager in a white tuxedo. His most famous match was a semi-stunt “feud” with local sportscaster Herb Winches that ended in the ring. Years later that would be replicated to a lesser degree with Paul Finebaum, who is now a host on ESPN's SEC Network. Tenenbaum also discusses how Vince McMahon transformed professional wrestling into a national obsession, to the detriment of the regional circuits where the Great Kaiser made his name. As his wrestling career wound down, aside from the occasional publicity bout, he turned back to his music while caring for his aging parents, who eventually came around regarding his wrestling career — especially his mother’s reaction to his being inducted into the Birmingham chapter of the National Wrestling Alliance Hall of Fame. On occasion the two worlds did mix. The Great Kaiser’s theme song was “Edelweiss,” and he was known to sing it occasionally in the ring at matches. 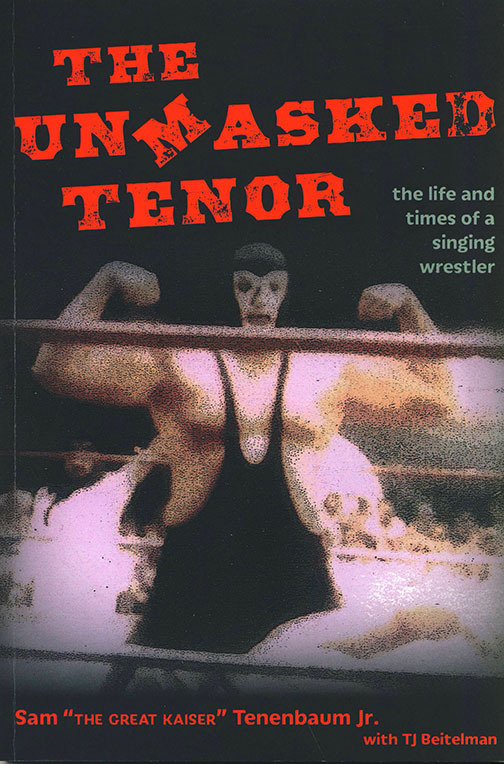 Written in the first person, not only is the book a window on growing up Jewish in Birmingham and venturing into a world that has little Jewish participation, it also gives a perspective of the athleticism needed to make it in wrestling, along with the showmanship and storylines.